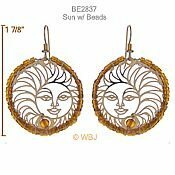 Our dramatic Sun Face Earrings are bursting with amber and glass beads! Bold and beautiful! Featured here in gold plate with 14K gold fill earrings, this style is also available in rhodium plate with sterling silver earwires.